This week’s Wordle words are sourced from Nicole’s prompt 209 Liturgy and Prompt 210 Word of Mouth. A reminder to everyone: please don’t panic or despair at the number of words – just use what calls your name, tickles your fancy, extracts your ink. If they all call to you, kudos. If it’s only a few, again, kudos. And feel free to manipulate the words’ form and tense as you wish. When you’re finished, post your link in the comments section. If you don’t have a blog, you paste your poem in the comments box, if you wish to share. Use as few or as many words from the wordle list. Change the form and tense of any word you wish. Write a poem about anything under the sun. Then post your link in the comments section. If you don’t have a blog, you could simply paste your poem in the comments, if you wish to share. Have fun, and most importantly … HAVE FUN!! Tis true, the sheer size of the wordles have inhibited me. Yes, I know we can pick and choose, but somehow it doesn’t work like that for me with wordles – I write dreadful poems just to get them all in, and then wish I hadn’t bothered! Also, there have been umpteen wordle-type prompts flitting about this Napo, and I can’t do them all. I promise to try, but don’t hold your breath! Viv, you don’t have to get all the words in. Repeat to yerself. Viv, how about this … let your eyes catch the first four words, and you may ONLY use those first four words that ‘your eyes’ selected. Would that help at all? You are such a creative writer, and I do so love your poetry. If you can’t find it in yourself right now, love and hugs to you just the same. That was fun! Thank you Misky for bringing these words together and to the poets who imagined them, too! I’m on my way to read your … erm … odd poem. LOL! Left a comment on your blog, Hank. Nice poem. A really wonderful poem. Thank you! Hi! Left a comment with your lovely poem. This is a beautiful poem, Donald. I left a comment on your blog. Thanks for joining in! Hey Donald, do join us over at Red Wolf Poems, the new incarnation of We Write Poems. Once again I did not get a link in my inbox. Not sure what is happening. But checked of course and found the latest. When you look at the top left black WordPress on your browser, is there a check next to the “Following” or “Follow” option? Not that this matters so much now, because all the prompts are now at their new home at http://redwolfpoems.wordpress.com Pop over to the new site, Ros, and click on the Follow option, and then you should receive email notification … unless you’ve set it up previously NOT to receive notification. You should check your WordPress Notification settings to confirm that you’ve asked for Immediate notification by email of new posts at blogs that you’re Following. I can’t post a comment to your blog. Tried several times but Blogger won’t let me use my WordPress credentials. I love your poem, and particularly like the idea of a knot of passion. Lovely words! Yes I am Following, which is odd. Will check new site. Have hit follow on new site and will check my WordPress. I have just changed computers and search engine so that may be an issue. I just went back into your blog using Firefox, and I still can’t post. My comment just flies away into the air somewhere. Sorry to leave your lovely poem without a comment there. Okay, it has defaulted to disabled so hopefully things will be back to normal. 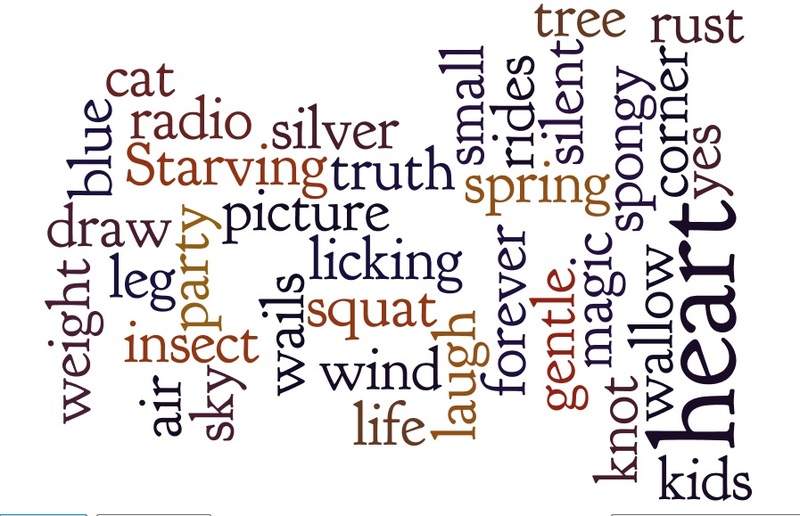 In case anyone came looking here, We Wordle #17 will appear on Red Wolf Poem this coming Thursday, alright?